Le Club AccorHotels has launched a 40% off sale (extra 10% off for Accor Plus members) for stays in the Asia-Pacific region between April 1, 2017 – March 31, 2018. Members can also participate in the 1 million points giveaway that awards 20 people with 50,000 points each. Note that Accor’s web page for this promotion has contradictory booking dates. The page states that the booking window opens on February 13 while the terms reference to February 20. The booking window ends on February 26. The sale is valid for bookings made in the following countries: Australia, Fiji, French Polynesia, New Zealand, Cambodia, Lao, Myanmar, Thailand, Vietnam, Philippines, Maldives, Malaysia, Indonesia, Singapore, China, Hong Kong, Macao, Taiwan, India, South Korea and Japan. You must have your Le Club AccorHotels account address in the Asia-Pacific region to participate in the points draw. Accor Plus members are eligible for an additional 10% off for total discount of 50%. I wish that Le Club AccorHotels would have someone checking the dates of these promotions. This is not the first time they have contradictory information on their website. The 40% (or 50% off) sale could be a good one if there is availability that fits your travel schedule. I am going to be in French Polynesia this summer for couple of weeks and could check out the property in Bora Bora. 1. General Le Club AccorHotels terms and conditions apply to the”1 Million Rewards points Up For Grabs!” offer and you must be Le Club AccorHotels member to benefit from it. 2. This promotion is not applicable in hotel partners of Le Club AccorHotels. 3. This offer is valid for a member’s stay from 01/04/2017 to 31/03/2018 in one of the participating hotels in Asia Pacific**, and booked between 20/02/2017 and 26/02/2017. 5. Any consecutive stays (check-out and check-in same day) in the same hotel, will be considered as a single stay. 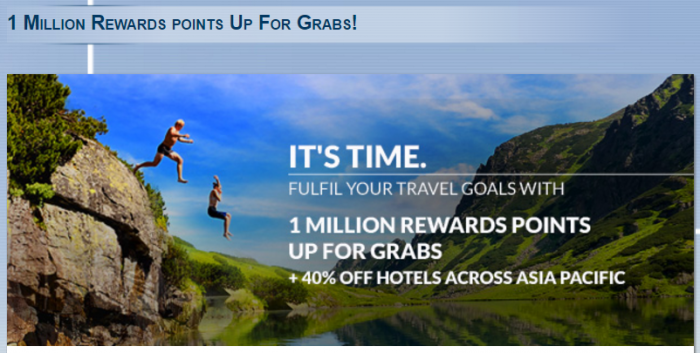 This single stay will be eligible once to the “1 Million Rewards points Up For Grabs!”offer. 11. Please specify the reference 48819 in all your communications with AccorHotels call centers or customers care services related to this offer. This offer is available only to members with an address in Asia Pacific**. You must register for the “1 Million Rewards points Up For Grabs!” offer before proceeding to the booking, to be eligible to the offer. 1. The special discount (40% off for Le Club AccorHotels members, 50% off for Accor Plus members) on best unrestricted rate is available for stays from 1 April 2017 to 31 May 2018. Blackout dates may apply. 2. The offer can be booked from 21 to 26 February 2017 for the public and 20 to 26 February for Accor Plus and Le Club AccorHotels members. 3. Bookings are payable in full at time of reservation and are non-exchangeable, non-refundable and non-transferable. No cancellations or changes are possible. 4. Offer is subject to availability at participating hotels. This Promotion cannot be combined with any other offer(s). 5. Accor Plus members receive an additional 10% discount and Accor Plus terms and conditions apply. Accor Plus benefits do not apply at participating Swissotel, Fairmont and Raffles hotels and all ibis budget hotels in Indonesia. 6. Le Club AccorHotels members can accumulate points with this booking in all participating AccorHotels, except ibis budget, Fairmont, Raffles and Swissotel hotels in Asia Pacific and all ibis Family hotels in China. b. employees of any agencies associated with the Draw. 3. In cases of conflict between the English language version of these terms and conditions and the local language version of these terms and conditions, the English language version of these terms and conditions shall prevail. 1. The Draw will take place on Wednesday 1 March 2017 at 15:00 (GMT + 08:00) and 20 winners will be selected from amongst the qualifying entrants. 2. Each winner will receive 50,000 Le Club AccorHotels Rewards points. 3. The Reward points will be credited to the member account within 10 days after the draw date. 4. Reward points are non-transferable, cannot be returned, exchanged or redeemed for cash or any sort of gift. The Promoter reserves the right to substitute the prize with a prize of at least an equivalent value. 5. The winner will be notified by a prize notification email at the address stated in their registration with LCAH. Entrants who have not won will not be contacted. 6. The draw winner is required to respond within 3 days from the date of the prize notification email in order to be eligible winners. The winner that does not respond will be forfeited, and the Promoter reserves the rights to deal with all unclaimed prizes in any manner deemed fit. 7. The Promoter’s decision regarding the award of all prizes, and/or in every situation including any not covered in these Terms and Conditions, shall be final and binding on all participants in the contest, and no queries, challenges or appeals may be made or entertained regarding the Promoter’s decision on the same. The receipt by any winner of any prize under this Draw is conditional upon compliance with any and all applicable laws, rules and regulations. 8. The Promoter may further communicate with the prize winner for the purpose of determining his/her eligibility to participate in the Draw or eligibility to receive the prize, including contacting him/her to authenticate his/her identity and any submitted information on his/her citizenship and to carry out such other activities as are necessary to administer or organize the Draw. If the prize winner fails to provide the required information by the deadline or fails to promptly satisfy the Promoter as to his identity and eligibility, the prize winner shall be deemed to have forfeited his prize. 9. Acceptance of any prize shall constitute a release and discharge of the Promoter by each winner from any and all liability, claims, demands, causes of action, and/or damages which the winner may have, whether known or unknown at the present time, of any nature whatsoever, arising out of or relating to: (i) the contest, (ii) personal injury and/or property damage, theft or loss suffered by the winner as a result of the use and/or enjoyment of the prize, and/or (iii) any tax liabilities in relation to the contest, prize and/or use or enjoyment of the same. 10. The Draw is governed by these Terms and Conditions. Entry in the Draw implies unreserved acceptance of these Terms and Conditions, as well as of all provisions and ethical rules on the internet. 11. The full rules of the Draw have been deposited with Atlas Business Consulting Pte Ltd (Partner CPA firm – Edwin Lim & Co), 3 Pemimpin Drive, #06-01, Lip Hing Building, Singapore 576147. Any trademarks, graphic symbols, logos or intellectual property contained in any materials used in connection with this Draw, in particular that relating to the Draw prizes, are the property of their respective owners. Any unauthorized reproduction of these trademarks, graphic symbols, logos or intellectual property constitutes an infringement of copyright and is punishable by law. The Promoter cannot accept any responsibility for any damage, loss, injury or disappointment suffered by any entrant entering the Draw or as a result of entering the Draw or accepting any prize. The Promoter is not responsible for any safe custody, return, non-delivery or missing of entries, late, misdirected, problems or technical malfunction of any telephone network or lines, computer on-line systems, servers, or providers, computer equipment, software failure of any email or entry to be received on account of technical problems or traffic congestion on the Internet, telephone lines or at any web site, or any combination thereof, including any injury or damage to entrant’s or any other person’s computer or mobile telephone related to or resulting from participation or downloading any materials in the Draw. By entering the Draw or accepting the prize, you agree that no claim relating to such losses or injuries (including special, indirect and consequential losses) shall be asserted against the Promoter, its parent companies, affiliates, directors, officers, employees or agents from any and all losses, damages, rights, claims and actions of any kind resulting from the Draw and acceptance of any prize, including without limitation, personal injuries, death and property damage. 1. During the course of the Promotion, the Promoter may collect personal information of the participant. This may include, but is not limited to, the names, email addresses, telephone numbers and other details provided by the participant. Such data is collected for the purposes of verifying the identity of the prize winner, awarding the prize to the prize winner, publishing the results of the Draw and publicizing the Draw. 2. By participating in the Draw, the participant consents to collection, use and disclosure of the participant’s personal data for marketing and publicity purposes, including distribution of marketing materials for goods or services in the tourism, hospitality and services industries by the Accor Group and/or companies in the tourism and hospitality industry in which the Promoter holds shares, and contacting entrants in future to invite entrants to, or inform entrants about, events organized by the AccorHotels Group and/or such companies. 3. The Promoter shall comply with its obligation pursuant to applicable legislation, regulations and legal requirements in relation to data privacy. 1. In the event of a dispute, the decision of the Promoter is final and binding and no correspondence will be entered into. 2. These Terms and Conditions are governed by, and must be construed in accordance with, the laws of Singapore. 3. Any dispute arising out of or in connection with these Terms and Conditions, including any question regarding its existence, validity or termination, shall be referred to and finally resolved by arbitration in Singapore in accordance with the Arbitration Rules of the Singapore International Arbitration Centre for the time being in force, which rules are deemed to be incorporated by reference in this Clause. The Tribunal shall consist of 1 arbitrator. The language of the arbitration shall be English. All arbitration proceedings and all information, pleadings, documents, evidence and all matters relating thereto shall be kept confidential. *Ibis budget, Swissotel, Raffles and Fairmont in Asia Pacific, Ibis family in China and Partner hotels are not eligible for points. **Asia Pacific: Australia, Fiji, French Polynesia, New Zealand, Cambodia, Lao, Myanmar, Thailand, Vietnam, Philippines, Maldives, Malaysia, Indonesia, Singapore, China, Hong Kong, Macao, Taiwan, India, South Korea, Japan.